The Premier League’s relegation battles are some of the tightest in world football. Each year it is almost impossible to predict. After 7 games, there are 6 teams that are showing signs of being in this relegation battle. However, only 3 of them can go down. Which will it be? Glenn Murray is somehow as prolific as ever, even though he isn’t getting the same supply as he did last season. This is due to players like Izquierdo and Gross being injured. As of now, he is joint 6th top goalscorer, with 4 goals. He has a 56% shot accuracy which, at his age of 35, is outstanding. They haven’t started the season badly in terms of how they are playing, they have just been unlucky. Unfortunately for them, they have conceded 3 penalties in 7 games. For a team like Brighton, who have a strong defence, but not the best attack, a 1 goal difference could be crucial in determining whether they win, lose or draw the match. If they can just avoid conceding penalties, which should be relatively easy to do, then they should survive because surely this misfortune when it comes to conceding penalties cannot continue. There is also the matter of changing how they approach defending corners. Last season, they conceded the most goals from corners in the Premier League (16). Their set up whilst defending set pieces is very focused on man-marking. However, teams, and players, are figuring out how to exploit their man-marking. So, maybe either a combination of zonal and man marking or just zonal could be the answer. Soon, they will have both Izquierdo and Gross back from injury. Then they can really get back to their best. Once they’re back they will have the necessary creativity to survive the Premier League relegation battle. Firstly, I am just going to start off by saying that Mark Hughes will never manage a team to a top 10 finish again. He is tactically naive in the modern game. He tries to set his teams up either as a side that will be battling for relegation, or as if they are Barcelona. There is no in-between. In reality, Southampton have the quality to challenge for a top half finish. Hughes, however, refuses to acknowledge this and sets his team up in a way that just isn’t suited to him players. It isn’t defensive, nor is it attacking. What ever happened Southampton recruiting exciting, foreign managers like Pochettino and Koeman? Hughes hasn’t recruited the players that suit his style of play either; an exceptionally naive move to make, considering his 15 seasons in the Premier League. He also isn’t using his preferred formations, 4-2-3-1 or 3-4-2-1, but instead he is messing around with formations that he just isn’t familiar with in the modern game. His most notable signings have been Elyounoussi, Vestergaard and Ings. Elyounoussi has been exceptional at Basel over the past couple of seasons and could thrive under a system that is suited to his game. They now have a quality, experienced defence as well as 2 solid central midfielders in Hojberg and Lemina, who come from Bayern and Juventus respectively. 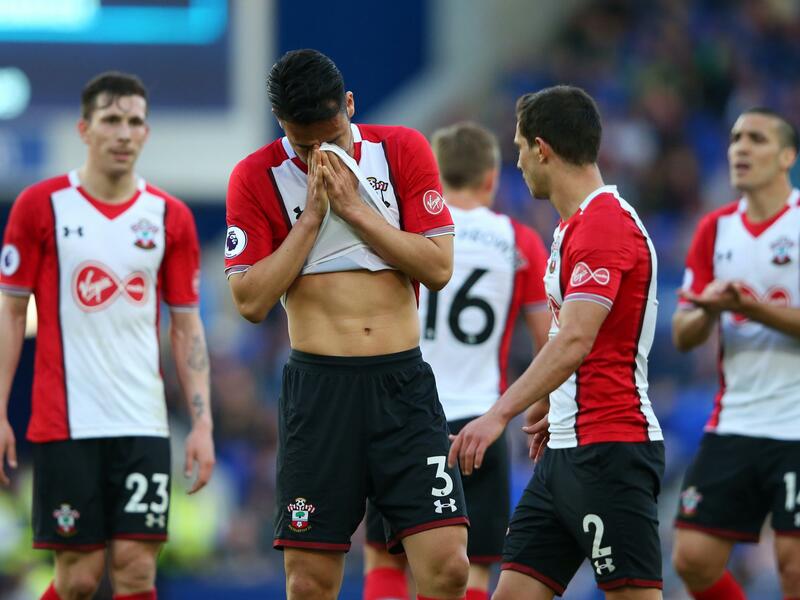 Another portrayal of Hughes’ tactical naivety has been shown through the fact that Southampton have conceded 4 goals from free kicks; the highest in the league. They have the tallest player in the league – Vestergaard, at 6’7″. They also have the height in other players such as Lemina, Hoedt and Austin. Ergo, they should be able to defend set-pieces. The only reasonable explanation for this is a fault in the way Mark Hughes requires them to set up whilst defending set-pieces. The only way Southampton will survive is if they either sack Mark Hughes, or the players have just enough quality to keep them up. They are getting shots off, they just aren’t scoring from them. However, they have a decent defensive record, with only 11 goals conceded, considering where they are in the league table. The signing of Danny Ings could be crucial. He showed at Burnley that he is a prolific goalscorer and he has already started to show it at Southampton. He will be crucial if they are to avoid relegation. This season Fulham have regularly rotated their starting 11, making at least 2 changes to each starting 11 for each game. This could be the explanation for their poor start to the season. They have recruited in mass which means that the players aren’t familiar with each other. The only way to solve this is by playing together and getting used to each players’ style. There is also a need to go back to the basics for Fulham. I can’t help but think that another contributing factor to their failures is due to Jokanovic playing players in their incorrect positions. For example, Le Marchand, a centre-back, is being played at left-back, Vietto, a striker, is being played at right-wing similarly to Schürrle. Ryan Sessegnon, arguably a Left Winger, is being played at left-back despite the recruitment of the more solid Joe Bryan from Bristol City. I think this comes down to a lack of structure in their recruitment. They have just bought players that are good, not players that they need nor ones that fit their system. What they need to do is play a front 3 of players in their correct positions, even if it means dropping Ryan Sessegnon. As well as this, a solid, consistent back 4 and most importantly, keep the same, balanced midfield three of Cairney, Seri and Zambo Anguissa for a run of games in order for them to gel and provide structure for the team around them. If they did this, their defensive problems would undoubtedly be reduced. Improving defensively is a necessity, considering they have the worst defensive record in the league. Then, they could kick on to potentially a mid-table finish. I also think it is a matter of Jokanovic not knowing his best team. Unlike some of the other teams mentioned in this article, Fulham actually have someone who can score goals, no matter how well the team is playing, in Mitrović, the joint 2nd top scorer. In previous years, teams who have suffered relegation from the Premier League haven’t had someone like this so it does look promising for them. I can’t imagine what Newcastle fans are going through. What used to be a big club rich with history is being turned into an apathetic business with no regard for the fans. Somehow they have managed to recruit Rafa Benítez, a Champions League winning manager. However, the ambition shown through this recruitment has not been matched by the clubs transfer business. Mike Ashley has not backed Benítez enough, which could see Benítez leave at the end of the season, or even before then, as he gets more and more fed up with the ownership of the club. The players clearly have the ability. They showed this last season as they finished 10th. Up front, they have a quality goalscorer in Rondon. Behind him, they have an experienced midfield and defence. Ayoze Pérez will also be key for them this season. If he can perform like he did at the end of last season, then they escape relegation. I feel as though Newcastle’s current struggles are simply down to their forwards’ poor form. The absence of Kenedy hasn’t helped as well. Now he is back, I expect their fortunes to change. Firstly, there is an argument that they should have sacked Neil Warnock at the beginning of the season. He has never kept a team in the Premier League in his 4 seasons. Sacking a manager who has gotten you promoted can be a very risky move, but it is one that has paid off for teams in the past. See Leicester’s title winning season, for example. They sacked Nigel Pearson despite him keeping them up the season before, against the odds, and replaced him with Claudio Ranieri who managed to win the league for them. Realistically, Cardiff’s squad is not good enough to survive in the Premier League. As of now, they are 20th in: goals scored, goals conceded, shots on target, passes made and passing accuracy. If they can replicate the defensive ability and form that they showed at home in the Championship then they could be in with a chance of survival. Albeit, a very small chance. 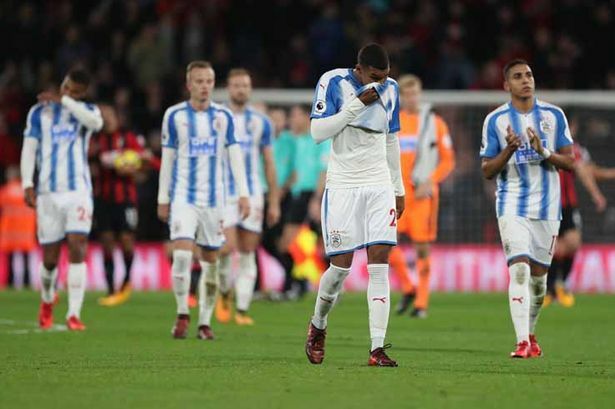 Last season, everyone had Huddersfield to be relegated, similarly to Cardiff this season. Last season, they just managed to survive; This year, that just doesn’t look like the case. Huddersfield have just 2 points from 7 games and are showing no signs of improving. They have a number of experienced players but they are seriously lacking a goalscorer. Up top, the Terriers have Depoitre and Mounié who, don’t get me wrong, have good spells, but they simply aren’t consistent enough. This season, they have played mostly in a 5-at-the-back formation, with only 1 striker and an attacking midfielder to support him. In this formation the wing backs are naturally full backs, rather than wingers, so they don’t possess as much attacking threat. Therefore, in reality, Huddersfield only have 2 attacking players in their lineup at any one time. Therefore, I just can’t see where the goals are going to come from. Ramadan Sobhi could be a good signing but he never showed his goal scoring ability at Stoke so signing him is a big risk even though he does have the potential. Mooy is an exceptional midfielder and is arguably one of the main contributing factors to the Terriers’ survival last season. However, he just hasn’t got into the swing of things this season, whether it be due to the formation or fatigue/disappointment from the World Cup. On the other hand, Wagner is a very good manager with a similar philosophy to Jurgen Klopp, so I wouldn’t be surprised if he manages to keep them up. Ultimately, a team needs to have a solid defence and the ability to score goals in order to avoid relegation from the Premier League. The clubs, out of the 6 mentioned, who have the potential for this are Fulham, Brighton, Southampton and arguably Newcastle. Each club mentioned needs things to go their way. For example, in Fulham’s case, their players need to gel and get used to each other. In Huddersfield’s case, Mooy needs to regain form. Saying this, however, I do think it will be Huddersfield as well as Cardiff and then one of Newcastle or Brighton that will be relegated down to the Championship.